Carbohydrates are everywhere. From rice to bread, east to west, it is difficult to find dishes and diets that don’t derive the majority of their calories from carbs. If we could just find a way to keep our bodies from absorbing these pesky calories, then we would be able to indulge in our favorite carb-rich dishes without gaining those extra pounds. Sounds like it’s just a hedonic fantasy, right? Interestingly enough, research suggests that blocking carb absorption is possible. Let me introduce you to the carb blocker. A natural supplement that may be your saving grace if you are struggling to cut out the carbs. What Exactly Are Carb Blockers (and Starch Blockers)? Firstly, to avoid any confusion as you are researching these supplements, both carb blockers and starch blockers refer to the same thing. Throughout this article, we will be referring to these supplements as carb blockers. In simple terms, carb blockers help “block” the breakdown of starches. This renders the starches indigestible, turning a molecule that normally would provide us with 4 calories per gram and increase our blood sugar into an inert substance that just passes through our digestive tract. Carb blockers are able to pull off this magical feat by inhibiting the action of specific enzymes that help break up longer chains of carbohydrates molecules into digestible simple sugars. The two main carb blockers available today are white kidney bean extract (which is also called Phaseolus vulgaris extract) and alpha-glucosidase inhibitors (AGIs). Both work by inhibiting different enzymes that are essential for carb digestion. White kidney bean extract works by inhibiting an enzyme (that is found in your saliva and released by the pancreas into your small intestine) called amylase which breaks specific bonds that hold starch (long chains of glucose molecules) together. This is the most popular and well-researched carb blocker. You can easily find and purchase it online or in a supplement store. Alpha-glucosidase inhibitors (AGIs), on the other hand, are a form of prescription medication used in the treatment of high blood sugar in type 2 diabetics. These carb blockers work by blocking the action of an enzyme called alpha-glucosidase that helps cut chains of sugar molecules into smaller pieces in your small intestine. Although you can’t buy this carb blocker as a supplement, you can experience its effects via a natural supplement that contains an extract from a Salacia plant. Salacia plants provide us with a natural source of alpha-glucosidase inhibitors. In fact, several studies on these plants have found promising results for glucose control and appetite reduction. In short, both supplements are effective at blocking carb digestion by inhibiting the action of different carb-specific enzymes. This means that some carbs will pass through the digestive tract as if they were fiber, helping to improve blood sugar control and boost weight loss in people who derive the bulk of their calories from starchy foods and other complex carbs (not processed foods with simple sugars). However, before we take a closer look at the research behind carb blockers, let’s develop a deeper understanding of why reducing carb absorption may be beneficial for our health. To understand the potential impact of carb blockers, we must start with the basics of carb digestion. The starch and other sugar-based chains that we get from complex carbohydrate sources (i.e., whole foods like fruits, vegetables, nuts, beans, and whole grains) need to undergo a complex digestive process before they can be absorbed by the body. When we consume starch, for example, our bodies need to use multiple mechanisms to digest them before they can enter our bloodstream. These digestive mechanisms include mastication (chewing), stomach acid exposure, and the breakdown of specific bonds with enzymes. After this process, most of the starch is converted into simple sugars and absorbed through the small intestine into our circulation. This increase in sugar availability promotes sugar burning and decreases fat burning and ketone production. If more carbs are absorbed than the body needs at that time, you will store it as glycogen (our storage form of sugar) and fat. Altogether, this process is normal and healthy, allowing us to use a quick fuel source (sugar) while preserving our long-term energy stores (fat). Once we burn off the sugar, we will then start burning more fat and ketones for fuel. This cycle repeats itself over and over again, helping us maintain a healthy weight. However, as we started to make our food environment into a hedonistic heaven for our taste buds, our food consumption increased, overwhelming our bodies with energy. In response to this energy overload, our bodies start storing more and more fat while our blood sugar escalates to detrimental levels. In fact, western society is struggling so much with the abundant food environment that type 2 diabetes and obesity are becoming the new normal. Although carbs aren’t the only culprit of the metabolic mess we find ourselves in, they are definitely one of the main contributors for most people. After all, the majority of calories in most diets come from carbohydrates. If you could just block the absorption of this one macronutrient, you would be able to (hypothetically) eat as much starch as you want without gaining a pound. Thus, carb blockers may be exactly what we need to provide us with a way out. It is a sound hypothesis, but what does the research say about the effectiveness of carb blockers? How Effective Are Carb Blockers at Blocking Carb Digestion? Now that we know the reasoning for using carb blockers, let’s look at the science to see how well they work. Unfortunately, the research indicates that they don’t keep you from digesting every carb you eat. At best, carb blockers appear to block 50–65% of carb-digesting enzymes. However, inhibiting these enzymes does not necessarily mean the same proportion of carbs will be blocked. One study examining a potent amylase inhibitor found that it only prevented 7% of the carbs from being absorbed (despite the fact that it can inhibit 97% of the amylase enzyme). This may happen because carb blockers don’t directly prevent carbs from being absorbed. They may simply increase the amount of time it takes for the enzymes to digest them. Other reasons for the lack of effectiveness may be explained by the fact that the binding process of the inhibitor to the amylase enzyme is highly influenced by pH, temperature, and co-ingestion with particular ions (i.e., nitrate, chloride, bromide, iodide, thiocyanate, and calcium ions). Also worth noting is the fact that the pancreas is able to increase the secretion of amylase. This is especially likely to occur when a carb blocker is ingested because they tend to slow down the digestive process. With all of that being said, carb blockers can still be effective for helping with weight loss and improving overall health according to several high-quality studies. The bulk of the research on carb blockers and weight loss was conducted using white kidney bean extract. Several studies show that this carb blocker causes a modest amount of weight loss. A meta-analysis uncovered that the average weight loss in groups that took white kidney bean extract was roughly 1.77 kg (3.89 lbs) more than control groups. A further meta-analysis revealed a statistically significant reduction in body fat of 1.86 kg (4.09 lbs) more than control groups. Interestingly, many of the studies indicate that people who ate the most carbs appear to lose the most weight while using these supplements. This makes sense because the higher the proportion of complex carbs in your diet, the bigger the difference carb blockers can make. Unfortunately, the bulk of the studies on white kidney bean extract were small, poorly designed, and largely funded by supplement companies so the results may not be very reliable. More independent, high-quality studies are needed. The data on Salacia based supplements (the other carb blocker we mentioned earlier) is not as promising, but still worth noting. There are no clinical trials that measured weight loss directly, but Salacia based supplements seem to reduce the absorption of carbs and have an appetite suppressing effect for females. Both of these factors may help increase weight loss (especially for women), but there is no high-quality data that backs up this hypothesis. In conclusion, carb blockers do help with weight loss, but only by a modest amount in people who are eating starch-rich diets. To lose weight sustainably in the long run, it is best to ditch the carb blocker and invest your time and money in a diet that helps you maintain a calorie deficit instead. One of the most effective diets at doing this is a low carb diet like the ketogenic diet. It can help you cut calories without noticing, and lose much more weight than a measly ~1.85 kg (~4 lbs). Can Carb Blockers Help with Blood Sugar Control and Diabetes? One study found that white bean extract helped reduce the glycemic index of white bread. As a result, white bean extract appeared to help normalize blood sugar levels in spite of the fact that a high glycemic index food was eaten. The same holds true for high carb meals as well. In a review of the literature, researchers concluded that white kidney bean extract “reduces the rate of absorption of carbohydrates, thereby reducing the GI [Glycemic Index] of foods.” This means that type 2 diabetics may be able to use this supplement to keep their blood sugar levels under control after indulging in a carb-rich meal. The effect that Salacia based supplements have on blood sugar and other important biomarkers have been studied as well with similar results. For example, one study found that, in response to being fed a sucrose (i.e., table sugar) solution, the participants’ glucose levels and insulin response were reduced compared to control groups. Longer term trials suggest that these changes translate to an overall decrease in pre-meal blood sugar and HbA1C levels (a key measure of blood sugar control) in patients with type 2 diabetes. However, it is highly unlikely that these carb blockers will prevent or reverse type 2 diabetes altogether. The only way to effectively do this (that we know of) is following the proper diet and treatment plan that helps you lose weight and get your blood sugar under control. One diet that has been proven to be helpful in this regard is the low carb, high fat ketogenic diet. Adopting a keto lifestyle can help you normalize your blood sugar levels much more effectively than carb blockers. In addition to reducing carb absorption, carb blockers may affect some of the hormones involved in hunger and fullness. They have also been found to slow stomach emptying after a meal, which further contributes to increased satiety and improved blood sugar control. One reason for this effect may be because white kidney bean extract also contains phytohaemagglutinin. This compound can increase the levels of many satiety hormones. One rat study found that the phytohaemagglutinin in carb blockers caused a significant decrease in food intake. The rats that had been given the compound ate between 25–90% less. However, this effect lasted only a few days. After a week of the experiment, the effects started to wear off, and the rats ate just as much as before. Also worth noting is the fact the rats ate up to 50% more calories once they stopped taking the carb blockers.The effect that carb blockers have on human appetite, however, has not been well-researched, so it is not clear if the animal results apply to us. The only human evidence we have is from a few recent studies. One of the studies found that a concentrated, standardized bean extract did decrease feelings of hunger, probably by suppressing levels of the hunger hormone ghrelin. Salacia based supplements were also studied for their appetite suppressing effects in humans. One double-blind randomized controlled trial found that a Salacia Chinensis supplement was able to decrease hunger in women, and other studies indicate that a higher dose may be effective for increasing satiety in men. The overall appetite-suppressing effect of this carb blocker is unclear. All we know so far is that Salacia Chinensis supplements slow stomach emptying and modulate the secretion of a few appetite and gut hormones. It’s hard to say if this effect is achieved with any of the carb blocker supplements currently on the market, or if the effect can actually contribute to weight loss in humans. Carb blockers have another unintended benefit — they increase the amount of resistant starch in the large intestine. This is because they decrease overall carb absorption, thereby increasing the starch that runs through the digestive tract. Resistant starches are typically found in starchy foods such as raw potatoes, unripe bananas, legumes and some whole grains. They are called resistant starches because they “resist” being broken down by the enzymes in the small intestine and enter the large intestine where they are fermented by gut bacteria. Many studies have found a correlation between resistant starch and decreased body fat, healthier gut bacteria, and improved blood sugar control and insulin sensitivity. Additionally, resistant starches may help increase the amount of fat your body burns after a meal. When carb blockers prevent the digestion of complex carbs in the small intestine, these carbs function like resistant starches. 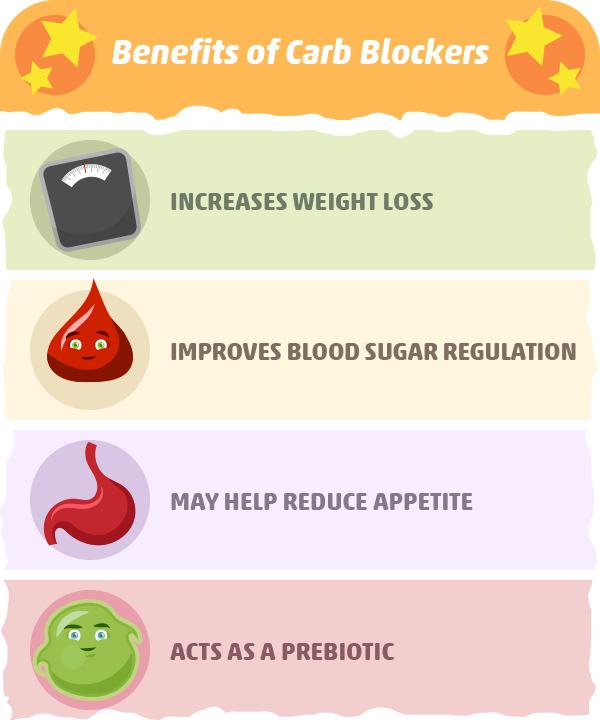 So, not only can you lose weight by using carb blockers, you can improve your gut health as well. At first, however, your gut may struggle to process so much resistant starch. This may cause some unpleasant side effects. The Side Effects Of Carb Blockers: Are They Safe? While carb blockers are considered to be very safe, that doesn’t mean they won’t come with adverse effects. As a result of altering carb digestion and letting more starch pass on to the large intestine, many people will experience several side effects like lowering blood sugar, diarrhea, bloating, stomach cramping, and gas. The most common side effects, however, are experienced in the gastrointestinal system. This is caused by the increased fermentation that will happen in your large intestine as a result of the extra starch that passes through the intestinal tract. Side effects from carb blockers may vary depending on the frequency and amount you use them. The gastrointestinal side effects are likely to diminish and eventually clear out altogether the more your body gets used to the use of carb blockers. If you decide to take a carb blocker, it is important to stick with the dosages that are proven safe and effective. For Phase 2 white kidney bean extract — the most widely studied carb blocker — a typical dose is 1 to 2 capsules, each containing 500 mg, taken before every meal. This translates to an average total daily intake of 1500 to 3000 mg per day. This dosage is both safe and effective. The only time white kidney bean extract may be not be safe is if you exceed a daily intake of 10,000 mg.
One of the most well-studied alpha-glucosidase inhibitors, Salacia chinensis extract, was found to be effective for improving blood sugar control at 200 mg – 500 mg with a carb containing meal. Supplementation of other commonly studied Salacia plant extracts (i.e., reticulata and oblonga) indicates that an oral dose of 240-1,000mg with carb containing meals is best. The safety of higher doses has not been studied. Who Should Avoid Carb Blockers? As with any other supplement that impacts the way your body functions, it’s important to see a doctor before you try it out. If you take insulin or another form of diabetes medication, it is especially important that you speak with your doctor before taking a carb blocker. Using carb blockers in conjunction with diabetic medication can lower your blood sugar to dangerous levels. While carb blockers can help you lose a few extra pounds, it’s not that magic weight loss supplement that we’ve been hoping for. And while several studies prove that carb blockers will help you lose weight, it isn’t a supplement that will give you consistent results. Carb blockers can help us improve our gut health, reduce our appetite, and maintain healthy blood sugar levels as well, but the evidence is not as convincing as the data on high-quality dietary interventions. keep you in a calorie deficit without having to fight against hunger and cravings. One diet that has been proven time and time again to do all of these things for many people is the low carb, high fat ketogenic diet. It is much safer and more reliable than taking carb blockers and/or following many other popular diet fads. If you’d like to try this way of eating for yourself, check out our comprehensive keto guide. 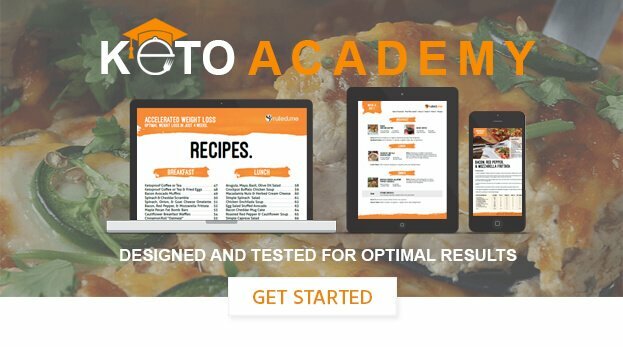 It’ll give you all the info you need to get started on your keto journey.